NVMe Verification IP provides an smart way to verify the NVMe bi-directional bus. The SmartDV's NVMe Verification IP is fully compliant with NVM-Express-1_3b-2018.05.04-ratified specification and provides the following features. Support for all Transaction types/Opcodes. - > Supports complaint and optimized TLP packets. NVMe Verification IP comes with complete test suite to test every feature of NVMe specification. Functional coverage for complete NVMe features. Callbacks in BFM’s and Monitor for various events. Faster testbench development and more complete verification of NVMe designs. Easy to use command interface simplifies testbench control and configuration of NVMe Host and Controller. SmartDV's NVMe Verification env contains following. Complete regression suite containing all the NVMe testcases to certify NVMe BFM's. 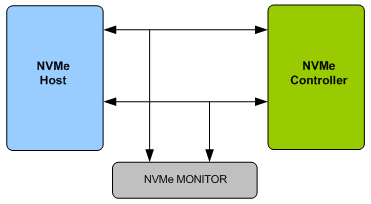 Examples showing how to connect various components, and usage of NVMe BFM and Monitor.